Quarles & Brady LLP, was looking to replace a national pro bono project that was ending when a client suggested helping veterans. The idea resonated with Colleen Miller, a commercial litigation partner and chairwoman of the Tampa, FL., office's charity/community initiatives, because she was raised in a military household. She began to dig around for opportunities and her research turned up The Veterans Consortium. "I thought the program sounded phenomenal,” she recalls. She did more research, connected with TVC staff members, attended a training session and dove right in. She took a U.S. Court of Appeals for Veterans Claims case through the Pro Bono Program and set up training sessions at her firm's Milwaukee and Tampa offices involving over 130 lawyers, including some from the firm's eight other locations. For her effort, enthusiasm, and tireless dedication to serving our nation's veterans above and beyond the call of duty, Miller has been selected as The Veterans Consortium Volunteer Inspiring Pro Bono (VIP) for July 2018. It turns out the man was a homeless veteran with an Other Than Honorable discharge due to mental illness. He told Miller he was unable to get the benefits he needed. Miller called Danica Gonzalves, Esq., Equal Justice Works Fellow and TVC Discharge Upgrade ProgramSM manager who, with the man's permission, was able to obtain his records to see what was going on. "His story was exactly as he told it, and then some,” says Miller, 36. "He tried to get help before his discharge, and he tried to obtain emergency leave." Miller took the case and will pursue a discharge upgrade on his behalf. "It's the coolest case, it's just so random that we met,” says Miller, a graduate of University of Miami School of Law. "It really showed me, there's a reason I'm doing what I'm doing." Courtney Smith, Esq., director of outreach and education for TVC, says the way Quarles & Brady have embraced the pro bono work with veterans has been remarkable. "It is an incredible opportunity for us to work with some exemplary lawyers who are using their time, talent and resources to help our veterans,” Smith says. 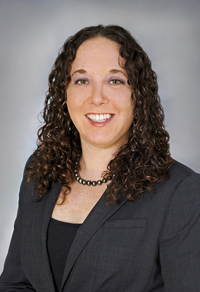 "Colleen Miller is an outstanding advocate and we are so pleased to have her as part of our team. This is a well-earned recognition as truly she is an inspiring pro bono attorney."